And you think Apple are innovative? In 1900, sponge divers were exploring the depths near the Greek island of Antikythera, between Kythera and Crete. They discovered an ancient Roman shipwreck, now known as the Antikythera wreck, filled with Greek artefacts presumably being taken back to Rome. Radiocarbon dating and archaeological evidence suggested that the ship sunk around 65 BC but more recent discoveries suggest it could be 150 years older than that. The divers recovered many artefacts including bronze and marble statues over the following year. Among the recovered objects were what looked at first glance like a bunch of rocks. It was months after they had been recovered that someone noticed what appeared to be a mechanical gear sticking out of one of the rocks. Hidden from view, faded by the centuries underwater, the fragments contained precisely-cut gears with tiny teeth like the ones you see in modern clocks. Piecing the clues together over the last century, it has become clear that the “Antikythera mechanism” is an analog computer designed to predict astronomical events. Inscriptions on the device talk of spinning globes powered by the device, revealing the positions of the timings of the planets, the Sun, the moon, eclipses, and even the athletic games. The device models the known universe, as it was seen 2,000 years ago. The technological complexity and workmanship cannot be overstated. When we say it’s ahead of its time, we don’t mean by 50 or 100 years. The Antikythera mechanism is utterly unique in antiquity. We don’t see anything close to its complexity and quality for another thousand years. Europe didn’t have anything similar until the 14th century. Having spent over 2,000 years underwater, the Antikythera mechanism has seen better days. The mechanism has been broken into fragments of which 82 were been recovered but it seems likely that some are missing. Fragments of wood suggest it was encased in a cabinet but we’ll never know exactly what that looked like. Fragment A, the largest piece of the Antikythera mechanism. Image by Wikimedia user Marsyas, distributed under a CC BY-SA 3.0 license. The Antikythera mechanism is often described as the earliest computer. When the gears were discovered, it was presumed to be a clock-like device. In 1951, the fragments had been cleaned enough that it was possible for Derek J. de Solla Price to study the recovered parts and get an idea of what it really did. His investigation, published in Scientific American, revealed a mechanical, analog computer capable of predicting the timings of celestial events and it was far more complex than anyone had ever imagined. In the 1990s, X-ray imaging was used to investigate the device in more detail but it still hadn’t really attracted the attention of mainstream researchers or the public. It got more attention from UFO magazines than academic journals as the only possible explanation for an analog computer in antiquity was aliens. 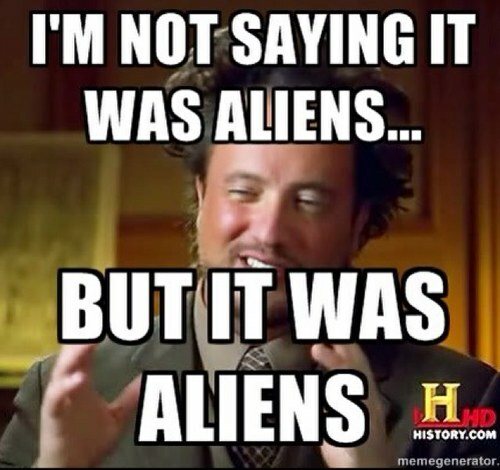 We’re not saying it was aliens, but it was definitely aliens. CT-scans in 2006 generated a surge of academic interest after researchers at Cardiff University found hidden inscriptions and discovered more complexity and function. Fragment A alone contains 27 gears. There are 30 gears in total, recovered from the 82 remaining pieces. Researchers have created models of the mechanism to see if they can get it to work and it always required at least a few more gears so it’s believed that other parts are still buried at sea. Computer models have helped researchers propose working set-ups for the Antikythera mechanism. These models combined with X-ray and CT-scans have revealed an exceptionally sophisticated device. Mike Edmunds, the leader of the team that did the 2006 CT scans, described the device as “extraordinary” and “the only thing of its kind”. A mechanical model of the Antikythera mechanism, made in 2007. Although we don’t know exactly what it looked like, the hidden inscriptions reveal an impressive sight. Inscriptions explain when and where to find certain stars, which is vital to using the device properly as the planets would appear on a backdrop of stars. The inscriptions reveal that the hands had colourful balls on them to represent the different celestial bodies. The Sun is described as the “golden little sphere”. Just imagine, turning the dial to another date and watching a little Sun, moon, and several planets move around the face of the device. It’s like some glorious artefact from Indiana Jones or the Uncharted games. And remember, this was built over 2,000 years ago. So how did it work on the inside? There are some mysteries but here’s what we know. A knob on the side of the device was used to turn time forwards or backwards and this turned lots of gears inside. The complex arrangement of gears resulted in hands moving on a clock-like face, showing important information about celestial bodies. The large gear in Fragment A rotated once for every year and controlled the Sun’s position. Other interlocking gears controlled the positions of the known planets at the time: Mercury, Mars, Jupiter, and Saturn. Here’s a schematic that shows one interpretation of how the gearing came together. This schematic gives an idea of the complexity inside the Antikythera mechanism. This is just one way of interpreting how the device worked. The schematic incorporates the known gears, the missing gears required to complete known functions, and some proposed features based on inscriptions. Image by Wikimedia user SkoreKeep, distributed under a CC BY-SA 3.0 license. To give an idea of how complex the machine was, take the example of predicting the location of the moon. It’s actually really difficult to predict the moon’s location because of its elliptical orbit of the Earth. The Antikythera mechanism coped with this by connecting two gears together with a pin-and-slot device, where one gear was slightly off centre. This allowed the moon, or “little sphere”, to mechanically replicate the difficult movement of the moon across the night sky at different times. Radiocarbon dating initially suggested that the device was built around 65 BC. Later, analysis of the inscriptions revealed to historians that it was designed around 150-100 BC. In 2014 the age was revised again after studying the back of the device, where there are 2 dials in the form of hands moving around grooves. One is a calendar that shows lots of useful information including times for the athletic games. The other dial predicts both lunar and solar eclipses. It was the eclipse prediction that led to a recent discovery that may have moved the age of the mechanism from around 100 BC to at least 205 BC. Christián C. Carman and James Evans compared the eclipse predictor to Babylonian records of eclipses and found that the device was set to predict events as early as 205 BC, 100 years before it was originally thought to have been used. Interestingly, Greek trigonometry wasn’t even around in 205 BC so the Greeks must have been using Babylonian arithmetic to predict eclipses. Intriguingly, the revised age fits well with an old belief that Archimedes created similar devices. Cierco wrote of a complex mechanical creation that predicted the movements of celestial objects sometime in the 3rd century BC. The device was apparently taken to Rome by Marcellus after the sack of Syracuse after Archimedes’ death in 212 BC. The revised date brings the device and Archimedes much closer in time so perhaps there’s something to the story. The claim isn’t that the two mechanisms are the same thing but it’s interesting that the Antikythera mechanism may have existed at a time when Archimedes was supposedly creating similar technology. It’s unlikely a device of this complexity would have been the first of its kind. There would have been simpler devices in a technological evolution that led to the Antikythera mechanism. Even its construction is surprisingly advanced, with extremely precise wheels using tiny teeth like we see in today’s clocks. Somewhere out there, similar analog computers from this era might exist. There could even be a complete copy of the same model or perhaps we’ll find older precursors. If the Greeks could build this, they likely had other geared devices created for other complex calculations. Could it really be that all of this technology lost or destroyed? The Romans were bringing this one back to Rome so they were clearly worth keeping. Somehow we’ve completely lost all trace of a technology, making our single data point appear to be over a thousand years ahead of its time. In the meantime all academics can do is probe further, create more models to test theories of how it worked, and look around the shipwreck for more fragments. For the rest of us, we can admire a technological marvel by visiting the National Archaeological Museum in Athens where the remaining fragments are all kept. It’s a technological marvel and should be celebrated. It’s like finding a Windows PC used by the Vikings.